Meng was arrested the same day Trump and Chinese President Xi Jinping – leaders of the world’s two largest economies – sat down for dinner on the sidelines of the G-20 Summit in Buenos Aires. Much to the relief of those with a vested interest in the global economy, with Washington poised to raise tariffs from 10-15 percent on $200 billion worth of Chinese products and Beijing sure to retaliate, Trump and Xi agreed to a temporary 90-day truce in the escalating tariff battle. The current ceasefire is certainly timey with fresh signs of economic weakening in Europe and China threatening to slow down the U.S. economy. When markets closed on Friday, December 15, the Dow Jones Industrial Average entered correction territory for the first time in three years. Ironically, since Mr. Trump initiated his aggressive trade policies, U.S. exports have fallen and American trade deficits have increased, which bears out the reality that the U.S. economy – and by extension, White House strategy – does not exist within a vacuum. If you pull down a pillar in the basement, the roof will shake. Rising fears of a U.S.-China divorce, an outcome closer to reality than a year ago, owe to China’s importance in the global economy and the depth of the two countries’ interdependence – important distinguishing features from the U.S.-Soviet rivalry during the Cold War. On the world stage, China ranks first in economic size on a purchasing power parity (PPP) basis, value-added manufacturing, merchandise trade, and foreign exchange reserves (including in U.S. dollars). China also claims to be the largest trading partner of over 130 countries, a list that includes the United States. China is currently America’s largest merchandise trading partner, its third-largest export market, and its largest source of imports. American companies, such as technology leaders like Boeing and Apple, have extensive operations in China and sell their products in China’s huge domestic market while taking advantage of lower-cost labor for export-oriented manufacturing. As a recent Congressional report notes, these operations have helped some U.S. firms remain internationally competitive and supplied American consumers with a variety of low-cost goods. 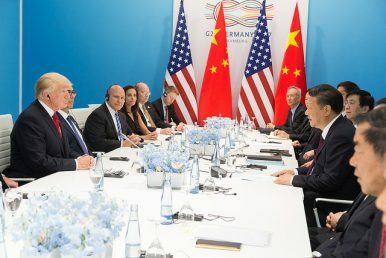 But Trump’s tariffs threaten to disrupt this relationship on the basis of Beijing’s “economic aggression”– forced technology transfer, intellectual property theft, unfair market access, and cyber-attacks. In fact, the president has threatened or implemented tariffs totaling $517 billion worth of imports from China, a sum equal to nearly all 2018 U.S. imports from China. The need for a pause on the tariff front also exposes the underlying legal mechanics pushing U.S. policy. Early in Trump’s tenure at 1600 Pennsylvania Avenue, his administration initiated a number of trade-related investigations. U.S. Trade Representative Robert Lighthizer, now Trump’s designated lead China negotiator, has shrewdly relied on arcane legal tools – such as Section 301 of the Trade Act of 1974 – to set the trade war in motion. Section 301 provides a means by which the United States can enforce U.S. rights under trade agreements and addresses “unfair” foreign barriers to U.S. exports. In the 1980s, while Donald Trump was headlining the New York tabloids, Lighthizer was cutting his teeth in the trenches of U.S. trade policy as part of the Reagan administration. It is not without coincidence that Section 301 was most widely used during the Reagan era – 49 of the 125 total investigations ever conducted took place during this period. This was a time prior to the Uruguay Round of multilateral trade negotiations. With the establishment of the World Trade Organization (WTO) in 1994, the United States invoked this legal remedy less often. The Peterson Institute for International Economics reports that there has only been one new Section 301 investigation since 2001. Starting in 2010, during the Obama administration, the United States brought all trade disputes involving WTO members directly to the WTO for dispute resolution. In contrast, Lighthizer is now seeking to effectively dismantle the WTO adjudication process by blocking the appointment of new judges to the organization’s appellate body. Section 301 provides a means by which the United States can enforce U.S. rights under trade agreements and addresses “unfair” foreign barriers to U.S. exports. Thus, the Trump administration use of Section 301, rather than utilizing the WTO for dispute resolution, is a departure from past U.S. practice, but consistent with Lighthizer’s legal background and philosophy. Importantly, Section 301 actions involve specific procedures and enforceable timeframes, like a 12- to 18-month timetable to seek a negotiated resolution with the targeted country. When Trump decides to pause U.S. tariffs, he is tapping the breaks on a bureaucratic machine that would otherwise roll forward. Which brings us back to Meng. When I sat down with CGTN’s Elaine Reyes to discuss Meng’s detainment, she asked whether Trump was aware that the Huawei CFO was being arrested at the time of his dinner date with the Chinese president. I am inclined to take the word of John Bolton, Trump’s National Security Advisor, that the president was uninformed; however, the more revealing fact is that Bolton admittedly knew in advance. It would be a mistake to believe that top officials within the U.S. government were ignorant of an extradition request for a high-profile Chinese citizen – a well-connected C-suite executive of one of the world’s largest telecommunications firms – particularly given the potential costs to ongoing U.S.-China diplomacy. As I noted in the Yale Journal of Regulation, from his first day in office, Trump has executed novel and aggressive measures intended to downsize both the imprint and influence of federal executive agencies. Yet even amidst his declared war on the so-called Deep State, the president has relied on elite Washington insiders and old Beltway hands, such as Bolton and Lighthizer, who bring knowledge of what it takes to move the levers of government to achieve their ends. Against this backdrop, an otherwise routine administrative request from the United States to its principal extradition partner Canada takes on greater significance. Extradition is an act under which the executive of one state, the requested state, surrenders a person within its territory to another state, the requesting state, in order to face criminal proceedings in the latter state. Canada handles approximately 100 extradition requests per year, the majority of which come across the border from the United States. The 1971 U.S.-Canada bilateral extradition treaty and Canadian 1999 Extradition Act are the primary guideposts for the process. Extradition in Canada is effectively carried out in two stages: First, a judicial committal hearing and second, surrender proceedings overseen by the minister of justice. There are deadlines and timeframes to consider in both. For example, within 60 days of Meng’s arrest, the United States must provide an extradition package including the underlying arrest warrant, evidence justifying the arrest, identification of the detainee, and certification by a judicial authority or prosecutor who attests that the evidence is available for trial and is sufficient to justify prosecution. The 1999 reform of Canada’s extradition law – initially enacted in 1877 and modeled after British law – lessened the evidentiary burden to support extradition requests. Moreover, judicial review of the criminal case against the accused is limited, as the law presumes a respect for the criminal proceedings and judicial process of the requesting state. The minister of justice, acting on behalf of the executive branch, holds greater discretionary power. Dr. Gary Botting, a criminal attorney specializing in extradition matters, has criticized the Canadian extradition process for lacking a meaningful review of the foreign state’s allegations: “On rare occasion, the courts of appeal will send the matter back to the extradition judge or minister of justice for reconsideration in accordance with the law.” This review process is not free of flaw. Take for instance the controversial case of Hassan Diab, a Canadian citizen and professor at the University of Ottawa who was detained and then extradited to France on evidence so weak that the French authorities eventually dropped all charges – but only after almost a decade of legal proceedings and Diab’s multi-year detainment in France. According to Botting, in the 15-year period following the 1999 reform of the law, Canada denied only five requests for extradition. The laxity of the Canadian extradition regime likely did not escape the notice of U.S. prosecutors within Trump’s Department of Justice. Even though Canadian extradition to the United States is typically an expeditious process, Meng’s case raises the potential for extraordinary considerations. Last week’s bail hearings in Vancouver revealed that Meng is being accused of violating U.S. sanctions against Iran. Huawei allegedly used a Hong Kong company, Skycom Tech, to make illicit transactions in Iran and do business with telecom companies there. Meng is accused of directly defrauding “victim” American banks, which cleared financial transactions for Huawei and, thereby, inadvertently engaged in business with Skycom. By treaty and by law, for extradition to take place, Canadian authorities must determine if the American allegations against Meng meet the “double criminality” rule, namely whether Ms. Meng committed a criminal offense according to both the U.S. and Canadian legal systems. The double criminality rule is designed to protect the accused’s liberty from the consequence of offences not recognized as criminal by the requested state. Whether this will be a searching inquiry under Canadian law in Meng’s case remains to be seen, but U.S. economic sanctions law is extremely specialized and arguably unique. In the McVey (1992) case, the Supreme Court of Canada weighed a similar issue involving charges of conspiracy to export high technology (sensitive computer and satellite equipment) to the Soviet Union and the making of false statements to the U.S. government in relation. The high court read the treaty broadly to determine that an “extraditable crime” existed because the alleged conduct could fit within the crimes of conspiracy and forgery under the law of Canada. The U.S. request for Meng’s extradition is complicated by other factors, too. By treaty and by law, Canada may refuse extradition where the extradition is of a “political character” or otherwise “punishment” for a political offense. In other words, political offenses or inducements are not a basis for extradition. Under the 1999 Extradition Act, the minister of justice has the authority and discretion to refuse to surrender a person on this basis. China’s detainment of several prominent Canadians suggests that Beijing interprets this episode as open to political reprisal. It is, therefore, not surprising that Canadian Foreign Minister Chrystia Freeland reacted harshly to Trump’s threat to interfere in the extradition process for the purposes of national security or as part of a larger trade deal with China. Indeed, by suggesting that Meng’s extradition is subject to political intervention and the volatility of his trade war, Trump’s may have inadvertently furnished new legal grounds for challenging the nature of America’s extradition request. It is also another reminder that once placed in motion, the wheels of government are not easily slowed. The Trump administration’s foreign policy has been a strange mix of impulse and calculation. This may have been reasonably foreseeable given the character of the president and the nature of a select few on his team. However, the results are anything but predicable, particularly in relation to his China policy. With the principled, yet contentious resignation of U.S. Secretary of Defense Jim Mattis, we may see further upheaval. According to political scientist Richard Neustadt, in his classic study Presidential Power, temperament is the distinguishing factor in presidential leadership. Neustadt cites the great Supreme Court Justice Oliver Wendell Holmes, who famously observed that U.S. President Franklin Delano Roosevelt possessed “a second-class intellect, but a first-class temperament.” Mr. Trump may one day be rated as having a third-class temperament and a first-class temper, having bullied the intellects the second he entered the class. The problem for the United States, China and the remainder of international community is that the current unpredictability in American leadership can lead to miscalculation and mistake. The passing of U.S. President George H.W. Bush has spurred a renewed appreciation for the value of an understated, but steady hand in the White House. Geopolitical transitions are fraught with tensions, a reflection on the insecurity of our human predicament. And uncertainty can take a logic of its own. Slowing down, taking a pause to measure the ends and means of policy, appreciating how the machinery of conflict is unfolding, keeping lines of communication open – these are all necessary steps to mitigating risk. Bulgakov, from the west bank of the Dnieper, explains: “Of course man is mortal, but that’s only half the problem. The trouble is that mortality comes to him so suddenly!” And often, the devil is in the details. Roncevert Ganan Almond is a Partner and Vice-President at The Wicks Group, based in Washington, D.C. He has counseled government authorities in Asia, Europe, the Middle East, Africa, and Latin America on issues of international law. He served as an aide to Hillary Clinton’s 2008 presidential campaign, but is not currently affiliated with any campaign. The views expressed here are strictly his own.